Aragón, made up of three provinces – Zaragoza, Huesca and Teruel - is a sparsely populated region and also one of great contrasts in climate and landscape, with the Pyrenees to the north and the “Cordillera Iberica” to the south. Temperatures also vary - from the cold snows again in the north to the more temperate climes of the southern prairies. It is also a land of castles, romantic churches, woods and rocks. This is one of the undiscovered areas of Spain, yet one of the most beautiful. It is worthwhile making time to explore this land of contrasts. It is sure to provoke a pleasant surprise for the traveller. 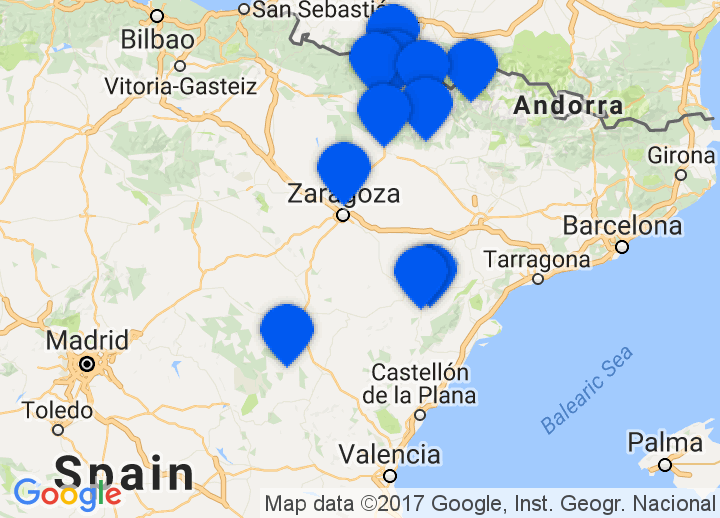 We have selected some great hotels, bed & breakfast and country inns in Teruel, Huesaca and Zaragoza for you. Whatever your taste, we’ll help you find that perfect getaway in Aragon. From the ski resorts in the Pyrenees in Huesca province, the prairies of Zaragoza and the lush landscapes on the Ebro valley in Teruel there is much to see. We especially recommend visiting the area of Matarrañas around the town of Valderrobres. The cuisine of Aragón is essentially based on meat. In the Upper Aragón region, for example, in the heart of the mountains, popular dishes include lamb and goat roasted on the spit, lamb and vegetable stew (a la pastora) and the so-called esparragos montañeses (literally mountain asparagus), which are in fact calves' tails. "Las magras con tomate" are very tasty: slices of slightly fried ham dipped in tomato sauce. Other recipes include partridge with chocolate, fried trout from the Pyrenees and the tasty hams of Teruel, which are cured in the cruel winter cold of the mountains; not to mention the soups, such as the one with liver and cheese, which was already known in the 17th century as sopa aragonesa (Aragonese soup). There is an abundance of fine wines in Aragón. In any bar or tavern, you will be sure to find exceptional examples. The best-known wine nationally is the Cariñena, which has an alcohol content of 18 degrees - so beware. Amongst the desserts, pears in wine should be tried as well as Aragonese candied or chocolate-covered fruit, guirlache and turrón (almond paste).